Michael Jackson’s death begs the question: Is propofol safe? Propofol is the most commonly used intravenous anesthetic drug in the United States today. In the hands of trained anesthetic professionals, propofol is very safe. Propofol in always injected directly into an intravenous line, and the onset of sedation occurs within seconds. The depth of sedation is dependent on the dose administered. Anesthesiologists commonly administer a dose sufficient to induce unconsciousness, which occurs within 15 seconds after the dose is injected from a syringe into a dripping intravenous line. The dose is based on the patient’s weight, the patient’s age, and the depth of sleep desired. In general, patients who weigh less, have advanced age, or have serious medical problems require less propofol. Propofol is a hypnotic, or sleep-inducing drug. It is not a potent pain-reliever, and for painful surgical procedures, drugs such as narcotics or inhaled anesthetics are commonly administered in addition to propofol to blunt pain or deepen anesthesia. The major hazard with propofol is that patients may stop breathing after a bolus dose, or they may obstruct their upper airway (think of severe snoring that transitions into total obstruction of air moving through the upper airway). Anesthesia professional are trained to manage these issues, and to keep adequate oxygen delivery and breathing to their patients. Some non-anesthesiologists are trained to manage the cessation of breathing or the obstruction of breathing caused by anesthetics such as propofol. These non-anesthesiologists include certified registered nurse anesthetists; emergency room doctors; ear, nose, and throat (ENT) surgeons; and oral surgeons who administer anesthetics. The majority of physicians, including internal medicine doctors, family practitioners, cardiologists, pediatricians, other surgeons, obstetricians, gynecologists, gastroenterologists, and psychiatrists do not have the necessary training to safely administer propofol. Propofol is commonly administered in ICU’s (Intensive Care Units) to sedate critically ill patients who are on ventilators. Most of these patients have an endotracheal tube inserted into their trachea (windpipe). This type of tube is very stimulating (consider violently you cough and choke when any fluid or food enters your windpipe). To tolerate the presence of such a tube, most patients require an intravenous sedative such as propofol to sedate them enough so they do not attempt to cough or pull the endotracheal tube out. The endotracheal tube is usually connected to a ventilator machine, which mechanically pumps an oxygen-enriched mixture into and out of the patient’s lungs. 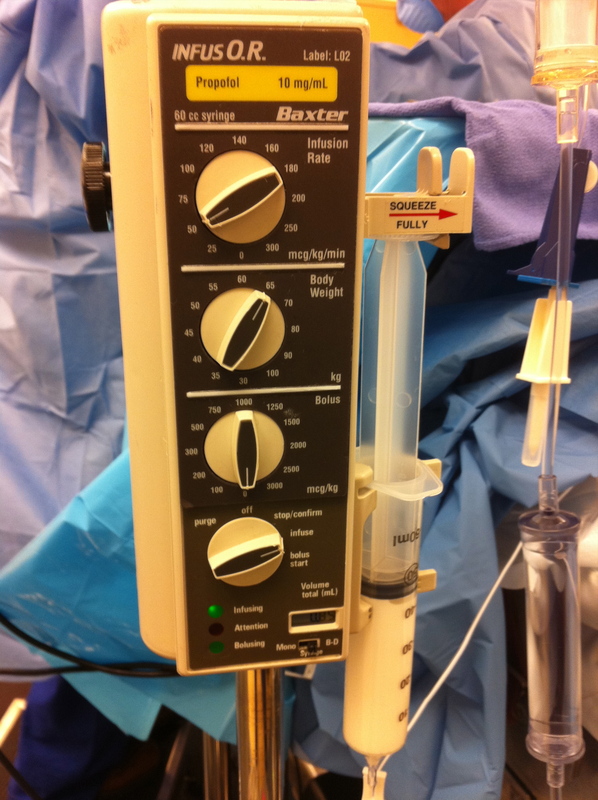 In this setting, the propofol is ordered by an ICU physician, and is administered through an electronic infusion pump. The ICU physician does not stay present in the ICU room minute-to-minute, rather an ICU nurse monitors the management of the pump, the propofol infusion, and the patient’s ICU care. The physician does not have to be present because the endotracheal tube is safely in place, the ventilator is connected, and the ICU nurse is trained to handle the sedation in this setting. If the patient needs increased sedation, the ICU nurse will increase the propofol dose. If the endotracheal tube were to become dislodged, the ICU nurse would page a physician who is present in the hospital—this would usually be an ICU physician or an emergency room physician (in a smaller hospital or some community hospitals). The circumstance of a physician or individual without appropriate anesthesia airway training supervising or administering propofol outside a health care setting, as occurred in the Michael Jackson case, is beyond any standard practice of prescribing or administering the drug safely. For consideration of Online Psychiatry treatment, see this link. Michael Jackson is undoubtedly the king. When i listen to his tracks i feel like he is still alive. Definitely one of the most significant music stars ever been born! How does propofol cause cessation of breathing? Thank you. Propofol is a potent hypnotic drug which depresses the brain. In high doses propofol can stop the brain from signaling breathing efforts to the rest of the body so that breathing ceases. I am scheduled for a colonoscopy in a Clinic setting that uses propofol for sedation. However, I had a PAT (Paraxysmal Atrial Tachycardia) an irregular & increased heart reaction to the general anesthetic during a previous surgery. Is propofol considered safe for me? Are there other sedation options available to me. Your EKG will be monitored during the procedure. Assuming you are now stable on some oral medication to suppress PAT, propofol anesthesia should be safe for you. If you develop PAT during or after the colonoscopy, the anesthesiologist will know what to do. If someone I know, age 85, was scheduled for endoscopy for heartburn, don’t the risks outweigh the benefits ? No bleed or tarry stools. The doctor’s office would not go over the risks of the procedure, or the sedation, even at tge patient’s request. It depends on the health status of the 85-year-old, particularly their heart, lung, and neurologic systems. We do see 85-year-olds having endoscopies without complication, if the preoperative health is satisfactory, and the sedation is given safely.